Pagoda, one of the wonders of Mumbai located in Gorai islands with 365 feets high. It took 11 years to complete construction which started in 1997 and completed in 2008. 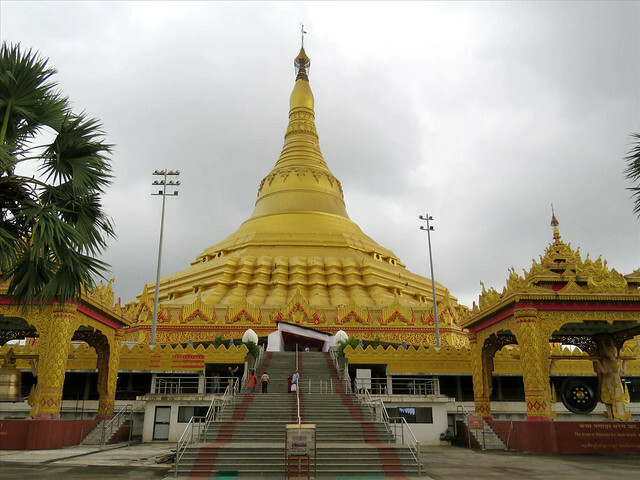 – The Global Vipassana Pagoda contains the world’s largest stone dome in centre built without any supporting pillars. – The height of the building is 96.12 meters and the dome is approximately 29 metres. The space inside pagoda is a huge meditation hall which accomodates 8000 people covering area of 65000 sq.ft. – Relics of the Buddha is enshrined in the central locking stone of the dome. – The structure can remain for next 2000 years. – Can withstand the earthquakes of any intensity. What else to see at Pagoda? – 22 feet Buddha statue carved from the single stone. – A Bodhi tree specially brought from Sri Lanka. – Photo gallery containing 122 paintings potraying the life story of Lord Gautam Buddha. The non-sectarian Vipassana meditation was taught by Mr S.N. Goenka. So the same course of Vipassana is taught for 10 days. It’s a rigorous course for which registration is required. 10 days free course includes stay and food. Dhamma Pattana, meaning the Harbour of Dhamma. It is part of the renowned Global Pagoda complex that opened in 2009. The building is modern, and all residential rooms are equipped with western facilities and air conditioning. Most courses taught here are geared towards business executives and professionals. For enrolling at Navi Mumbai centre click here or call 022-27522404/03. Special batches for children too. 1) Own vehicle: direct access by road to Pagoda is through Mira-Bhayandar is shown in figure below. 2) Direct bus from Bhayandar Station till the gate of Pagoda. – Get Esselworld ferry boat service. Charges Rs 50/- per head to and fro.